I saw Ida five days ago. 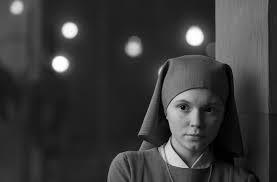 This is the Polish film by Pawel Pawlikowski about a novice nun faced with the choice of whether to take her vows or not. It’s set in Soviet Poland, ca 1962 I reckoned. The crucial thing about it is that it is made in black-and-white. This is a non-conformist choice (for a non-conformist film) and reminded me first of Bela Tarr (Satantango, Turin Horse et alia) who opts for b/w to depict the dreadful world of Soviet Hungary, and secondly of Haneke’s White Ribbon, who also uses b/w to depict the dreadful world full stop. It reminded me too of the b/w films of the Czech New Wave (Blonde in Love, Closely Observed Trains, The Party and the Guests and so on). B/w seems so right for Easten European Communism (although in fact there were plenty of colour films too). It also brought to mind the b/w world of Bresson’s Au Hasard Balthasar. Like Bresson’s films, Ida is a spare,strange story, all the more powerful for its leanness. In NFGG I write about paratactical cinema that mirrors the “and . . . and . . . and . . .” style of Biblical narrative, the masters of it being Bresson and Pawlikowski’s fellow Pole, Kieslowski. Ida has some of that narrative power too.